The COP15 promising ALBA mass meeting, see below. Seldom has so many organisers been misusing a great opportunity for political intervention to support climate protesters and democratic rights in general as at the mass meeting at the Valby hall on December 17 at 16.00 in Copenhagen during COP15. What could have been a strong left-wing contribution to the climate justice struggle became more of an exotic political show for Western Europeans to hope for other parts of the world to bring about change. I will come back to these critical remarks in length at the end of this article but first a regular report from the meeting. As such the meeting was predictable. It filled its purpose well of being a unique chance to meet many presidents or vice presidents from progressive regimes in Latin America and the Caribbean from the so called ALBA countries. Sometimes the feeling of being many at the same place sharing a hope together is of importance for sustaining everyday struggles. The role these countries have made it relevant during the Climate Summit to invite their leaders to share a moment of hope that it least somewhere changes can takes place in the whole society of social and ecological importance. 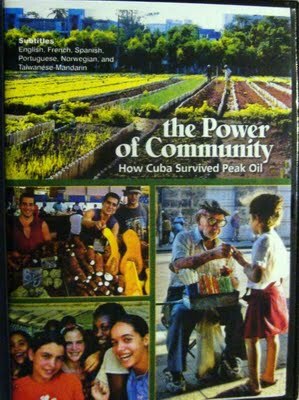 Cuba for being the maybe best example on earth on practical transition to a sustainable society. Bolivia for being an example for promoting climate justice demands. In general all ALBA countries for being examples of creating better conditions for the majority of people bringing hopes for alternatives. 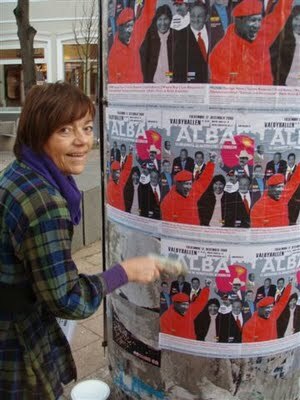 As the title of the meeting stated: ALBA a solidarity and sustainable alternative. The meeting started in traditional working class movement style with the Red Horn orchestra followed by welcome speach from the initiator Danish-Cuban Association and Anders Olesen, chair of the Danish Construction Workers Union, an organization also providing security guards. The Danish well known Savage Rose were playing as well as the protest singer David Rovics from the US who celebrated ”St.Patricks Brigade”, Irishmen who fought on the loosing Mexican side in the war against US 1846. Other musicians performing were Wayna Rap, Los Alejandros and Tamra Rosanes. There were almost 4 000 participants according to the organisers, 2 500 sold tickets at 100 Danish crowns and as many participants according to the main stream press and 3 000 to 4 000 participants according to friendly press. At 17.30 Esteban Lazo, vice president of Cuba entered the podium as the first speaker. He greets the meeting by saying that the first five years of ALBA has been celebrated in Havana. A human and solidarity alternative that shows that another world is possible. The response greetings to Fidel Castro and the Cuban revolution by the participants of the mass meeting. ”Cuba Si! Yankee No!” is the call from the floor and Lazo answers, I bring greeting from the Cuban president Raul Castro, and the leader of the Cuban revolution Fidel Castro. ALBA is not an alternative only for Latin America and the Caribbean, but for all people of the planet he continues. The Alba countries are today standing together with the progressive forces in the rest of the world in the struggle for the right of life and earth. We have to salvage this earth because we have no other. This is why the most important battle of humanity is taking place in Copenhagen these days. Lazo described the problems in the negotiations and the need not to allow the control of CO2 emissions come into the hands of the market. We should not speculate in the future of our and our children’s future. We are fighting not only for social justice but also for human survival. The solution to the climate problems lies in a new economic model that puts people at the centre concluded Lazo. Nicaraguan Foreign Minister Samuel Santos followed him stating that the ALBA countries alternative was the only sustainable. Santos made a similar speech as Lazo but was also responding to a comment from the audience in Spanish saying ”mujeres”, women. As the left wing Nicaraguan government have been accused by feminists movements for oppressive abortion laws the Foreign Minister was well prepared. He informed about free health care for women after and how mother care and family planning have saved many women’s life. The podium became more and more full of a mix of people, diplomats, an admiral in white uniform, security guards; from many members of the ALBA bloc. During Santos’ speech the atmosphere became more tense and people started to wisper that Evo an Hugo had arrived. Than from behind the scene they entered, the Bolivian and Venezuelan presidents that so many had waited for: »Compañeros!«. The cameras were flashing, hands shaken, bodies embraced at the podium and wolf whistling, chanting and applause from the audience at the scene and those sitting at the galleries comes forward to great the socialist leaders. »Venceremos! – Let’s win!«. Some presidents do not want to discuss the causes behind climate change, Morales started coming directly from the negotiations. I will tell you the cause: Capitalism. Capitalism is the worst enemy – both for life and the climate. – Let’s unite and defend our earth, Morales challenged the meeting. Inside the Bella Centret the leaders of the rich countries defend capitalism, a society of abundance for a few and wastage, the president told the meeting. »We are not alone on the struggle to protect Mother Earth. Only the support from blow can change the world. Help me say loud. The planet or death – Let us win! cried Evo Morales. The audience responded willingly. Then the Bolivian president Evo Morales surprised by announcing that a popular referendum is underway, and has been proposed for the entire world, to find out whether the world’s citizens would support or reject ideas for saving “Pachamama” (Mother Earth). His speech was greeted with applause on several occasions. Morales affirmed that even if the governments of the rich nations rejected such a referendum, the peoples represented in the organizations and demonstrations in Denmark had already expressed, with their protests, their initial approval of the initiative. Siiiii is the positive response in Spanish from the floor. Once more the hall is in unity with the speaker. Yet again is the answer from the floor Si! The hall agreed loudly. All five proposals had been adopted. Evo Morales had proposed exactly the same demands at the official conference with some minority support (except for the limitation to one degree temperature rise if Fidel Castro’s reports is correct). He concludes that we now finally had agreed to a document at this summit. As he was finishing his plenary speech for the basis for a world wide referendum Hugo Chavez came to his side. While Evo had used 15 minutes for his speech, Hugo now used two hours. “Long live the young people, the volcano of socialism, the volcano of the peoples!” So did Hugo Chavez start his speech. “On behalf of Venezuela, the Bolivarian revolution, the ALBA, I want to thank very much, the invitation to this event,” he said. It was all on live Venezuelan public service TV. “Long live Bolivar!” continued the president, recalling that on December 17, but on 1830, Simón Bolívar died. “Bolivar was an example of what should be a young revolutionary”, assured Chavez to those present. Chavez received his strongest response from the floor in the beginning of his speech when he declared himself a feminist, and said that all socialists and Marxists also must be feminists and support the rights of women. Only unity will bring us victory stated Chavez and quoted or mentioned both the Inca indian leader Túpac Amaru, Rosa Luxemburg, the Cuban revolutionaries Jose Marti, Fidel Castro and Che Guevara, Nicaragua national hero Sandino, Jesus, Muhammed and the Danish philosopher Søren Kirkegaard in his speech. He especially praised the activists inside and outside the Bella Centre conference and criticized strongly the brutality of the police. – I have seen much hard repression on the streets of Copenhagen these days, Chavez cried out, repression that you do not see in Cuba, Ecuador or Bolivia. He specifically gave full support to the attempt by demonstrators to use non-violent civil disobedience to enter the Bella Centre. System Change not climate change, the slogan used by the protesters was many times repeated in his speech. Chavez addressed the threat from US against the new socialistic revolution in the South and how new military bases are erected. Behind the facade of Obama the imperialists tries to stop this revolution and to threaten all the Latin American people. But we will resist and see to that that the empire will be defeated. – The revolution in the North is coming. I feel it. People in the north, unite with people in the South and let us together make the great world revolution against imperialism, capitalism and death! The celebration of these words exploded when Chavez resounding voice and fist signaled to the committed mass meeting participants the socialists revolution also in Europe. Have you red the Communist manifesto? Read it again! It will be relaunched. From Caracas we have called a meeting to establish a 5th International. As Karl Marx and Friedrich Engels established the 1st International, Rosa Luxemburg, was among those establishing the 2nd International, Lenin made the 3rd International and Trotsky formed the 4th International we are of the opinion that it is time to call for, to gather, to start the struggle for the 5th International. An international of both parties, social movements and trade unions building upon Marxism, socialism, communism and the true spirit of Christianity and Islam. Organize, Chavez challenged the floor and the meeting became excited. – A united people can never be defeated! Chavez! Chavez! Chavez! was chanted in chorus by the participants. After his speech Chávez went down to Morales and put his arm around him on the podium. – ¡Viva el socialismo! – Long live socialism they cried out. – ¡Viva!, – Long live!, the floor responded. ”¡Hasta la victoria, Siempre!” – Towards victory always! ”¡Patria, Socialisme o Muerte! Venceremos!” Fatherland, socialism or death! Shouted Chavez and he and Morales jumps down from the podium to reach out to all the outstretched hands in the front row. With them came rather surprised and not very pleased security guards and some somewhat lost Danish policemen while Hugo and Evo now slowly went along the barrier shaking hands and talked to people taking a good time doing it for almost half an hour. The band Somos una Venezuela could finally start very late after schedule while many now were leaving enthusiastic about their experience according to many reports. As one report concluded: They went from there with a hope in their hearts: Another world is possible.